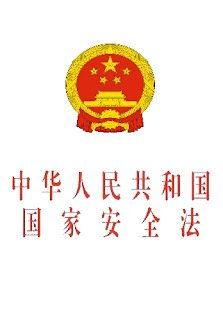 (Midland, Texas—July 10, 2015) Last week China’s National People’s Congress issued a national security law, which has been widely criticized for being intentionally vague and as a potential pretext to increasing restrictions on civil and political rights in China and to justify and perhaps enhance harassment of human rights lawyers, dissidents, and others perceived as a threat to the Chinese government. The cover of China’s National Security Law. The implications of the intent to “oppose” so-called “foreign influences” remains to be seen under this new context of a national security law in China, though many religious freedom and human rights advocates both within and outside of China are expecting greater restrictions on the freedom of religion and an increase in related human rights violations. To be sure, the Chinese government has historically used similar laws within various government agencies to suppress freedom of religion and justify related human rights abuses, though the laws included in the national security law may trigger a heightened level of persecution and abuse based on perceived threats to national security. Religious freedom advocates are also concerned with the law’s expansion of China’s restrictions on religion beyond the border of mainland China, namely into Hong Kong, Macao, and Taiwan. Thus, it appears that Article 11 defines citizens of Hong Kong, Macao and Taiwan as all subject to the provisions of the national security law, which has led some Hong Kong-based Christian leaders to express their fear that they might be penalized for serving mainland Christians via the Internet or while hosting mainland Chinese staying in Hong Kong for religious purposes. For example, on July 1, Hong Kong Pastor Wu Xiaohe was summoned by the Religious Affairs Bureau in Futian District, Shenzhen, China and received a notice demanding that he cease recruiting mainland Chinese Christian leaders to travel to Hong Kong for training through a website registered in Hong Kong. Interestingly, the Chinese government demanded that Pastor Wu stop these activities on exactly on the same day that the national security law was enacted. Pastor Wu stated that he believed that the combination of two specific articles (Articles 11 and 27) found in the national security law would negatively affect religious freedom in Hong Kong, which would become worse over time. Wu sited another example, stating that preaching to students from mainland China could also be deemed illegal, which would encapsulate 75 percent of Hong Kong pastors who regularly offer services to Chinese students living in Hong Kong. Pastor Wu and others worry that eventually China’s Religious Affairs Bureau may even attempt to open a branch in Hong Kong and, as a result, are attempting to raise awareness of the new national security law among Hong Kong religious leaders and the international community in an effort to protect religious freedom in Hong Kong and other affected regions.